British Columbia’s 600,000 kilometres of resource roads are a multi-billion dollar asset that needs a proper inventory as well as more active management. This is one of the conclusions of the B.C. Forest Practices Board in its report Access Management and Resource Roads: 2015 Update, released in April. “It is extremely difficult for the public and other users of resource roads to have any reliable idea of where roads are and whether they are accessible or safe for travel,” said board chair Tim Ryan. Resource roads are those on provincial Crown land that are not part of the highway and byway system. These roads are an important part of our lives. They provide access to the backcountry for outdoor recreationists, including campers, hikers, bikers, ATVers, snowmobilers, fishers and hunters, among others. Commercial interests such as ranching, trapping, silviculture and adventure tourism depend on these roads. And some of these resource roads provide access to private residences and First Nations lands. The report notes a large increase in the use of resource roads by the public, particularly for recreational pursuits, in southern B.C. Building, maintaining and deactivating resource roads are a significant expense for natural resource industries and provide a significant contribution to local economies. For example, recent annual expenditures of the forest industry were $90 million on construction and $80 million on maintenance and deactivation in the interior of the province. Moreover, the other users of these roads also contribute to B.C.’s economy. For example, think of all those Albertans camping or snowmobiling in our backcountry and the resulting flow of dollars into our province. Given that B.C.’s resource roads are such a large economic asset, it’s surprising how scanty our knowledge is about them. Government maps of these roads are substantially out of date. And resource roads are increasing, with an average of 10,000 kilometres of roads added each year. In recent years, many roads were built to salvage timber affected by the mountain pine beetle, and more roads are being built as a result of increasing activity in the oil and gas and mining sectors. The forest industry has built over 75 per cent of our province’s resource roads. Despite recommendations by the Forest Practices Board in a similar, earlier report, there has been no requirement or mechanism for reporting roads built by the forest industry since 2008. In contrast, the oil and gas industry has been required to file a report describing the location of newly constructed roads since 2013. And since 2014, oil and gas companies have been required to report the location of any roads that they maintain. The first recommendation of the Forest Practices Board is for the provincial government to provide a website that allows collaborative editing so that staff and the public can provide current information about road location and status. 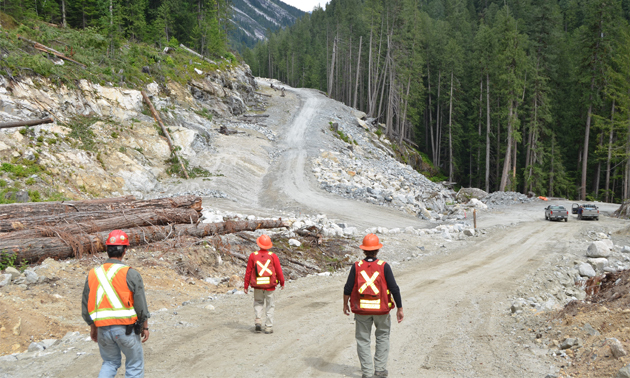 A promising effort, GeoBC has embarked on a BC Resource Roads Update Program, but it is estimated that the first round won’t be completed until July 2016. Industrial licensees maintain the resource roads that they build. Other users of those roads (commercial interests, the public and First Nations) can have no expectation that access will continue to be provided once the industrial licensee no longer needs the road. Maintaining access created by industry is not the routine responsibility of government. The Ministry of Forests, Lands and Natural Resource Operations maintains some access on forest service roads that serve communities, rural residences and high value recreation areas, but there is no formal mechanism for public input into that program. There is very limited opportunity for the public to be involved in resource road issues, and notification is the most basic level of public involvement. Again, the provincial government does not require industry to notify the public about construction or deactivation of these roads. This is a pervasive problem for the outdoor recreation community and adventure tourism operators. A completely functional road database is some years in the future. In the meantime, everyone with an interest in resource roads needs information about these roads— their location and status. How often do you travel on B.C.’s resource roads for work or recreation? Has your business experienced any problems because of the condition of resource roads or their change in status? Should the public expect continued road access to what was previously a remote recreational opportunity? Part 2 will discuss the management of and funding for resource roads. B.C.’s resource roads are a complex subject—stay tuned.